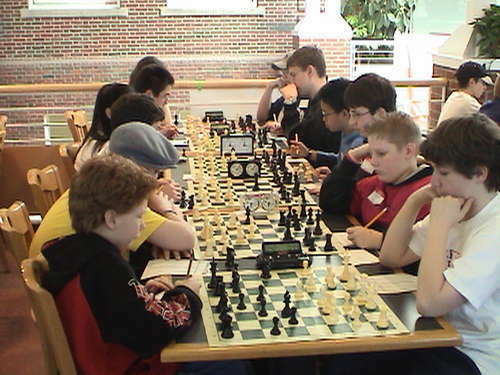 03.11.06 The University of Maine Memorial Union sprang to life during spring break as 327 chess players from schools across the State gathered to compete for top team honors at the annual State Scholastic Team Chess Championships, making this the biggest one-day chess tournament ever held in the State of Maine. 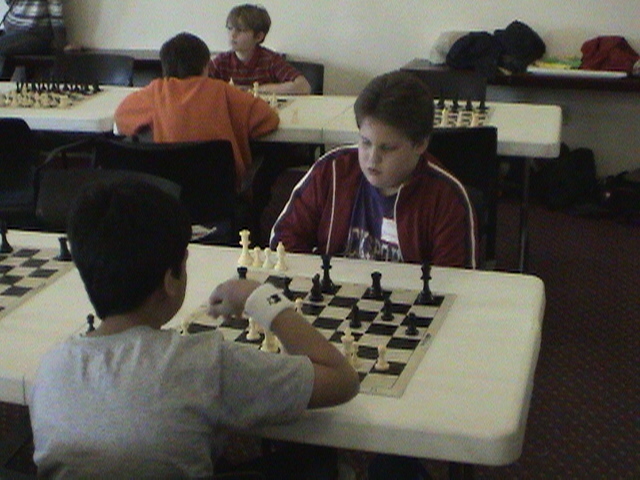 Players competed in K-3, K-6, Junior High and High School divisions, with Championship, Reserve and Novice sections. In addition, top-scoring players received invitations to compete in the Scholastic Individual Championships on March 25. In the K-3 division, with six teams competing, the Airline Community School from Aurora took home the first place team trophy with 11 of a possible 12 points. Anna Bryan and Haley DeLuca Lowell carded perfect 4-0 scores while team-mates Andrew Jones and Laddy DeLuca Lowell scored 3-1 records. Deer-Isle Stonington and Perry Elementary tied for second with 7 points, on tie-breaks, Deer-Isle received the second place team trophy. Also receiving trophies were Laddy DeLuca Lowell for the top girl player and Jeff Stanhope of Perry Elementary for top unrated player. The K-3 team score is the sum of the scores of the top three scoring players on a team. The top three scorers for Deer-Isle were Ivan Zembrusky, Reid Bartlett and Claire Diehlmann. 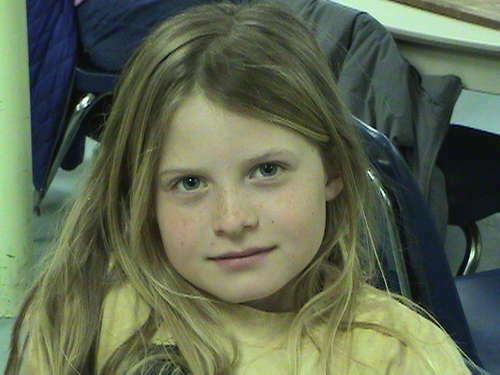 For Perry Elementary, the top three scorers were Macky Hood, Jeff Stanhope and Savannah Turner. Invited back to the Individuals on March 25 with scores of 3-1 or better were: Haley DeLuca Lowell, Anna Bryan, Andrew Jones, Laddy DeLuca Lowell, Ivan Zembrusky, and Jase Caron of All-Saints. In the K-6 division, again with six teams competing, Deer-Isle Stonington barely edged out Cape Elizabeth, 16 to 15.5. The total of the top five players for a team in this section is the team score. Top scorers for the winning team were David McManus, Sam Grindle, Nathan Davis, Nick Eaton, and Lucas Oliver. For Cape Elizabeth, top scorers were Peter Campbell, Matthew Fishbein, Daniel Brett, Shannon Daly and Ethan Duperre. Paul Rudnicki of All-Saints and Peter Campbell had perfect 4-0 scores. Receiving a trophy for top girl scorer in the section was Chelsea Brown of Deer-Isle Stonington, while Alex Silva of Cape Elizabeth received the top unrated player trophy. Invited back to Individuals on March 25 with scores of 3 or better were Paul Rudnicki, Peter Campbell, Sam Grindle, Matthew Fishbein, David McManus, Nathan Davis, Shannon Daly, Chelsea Brown, Ezra Briggs (Maranatha Homeschool Fellowship), Lucas Oliver, Nick Eaton, and Daniel Brett. In the Elementary Novice section, with the top three scorers total being the team score, Bucksport Middle School scored 11 points to best Belgrade Central Elementary. Top scorers for Bucksport were Joseph McNamara, Brady MacLeod and David Fucillo. Top scorers for Belgrade were Jacob Archer, Sean Boylan and Jai Aslam. 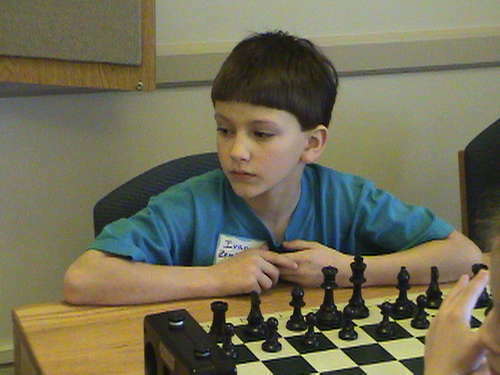 Top players in this section with 4-0 scores were Jordan Hill (Ames Elementary) and Joseph McNamara. In the JHS divison, 12 teams competed, with Deer-Isle Stonington edging out Orono 16.5 to 15.5. In this division, the top five scoring players totaled were the team score. The Deer-Isle top five were Jay Boyce, Andrew Babbitt, Ian Pelletier, Deven Haskall and Goldie Garcia. The Orono top five were Avery Cole, Ari Dimoulas, Jaiwei Zou, Nickolai Renedo and John Robinson. The two top Deer-Isle players turned in 4-0 scores. The top girl scorer was Margaret Bryan of Airline Community School with 3.5 points. The top unrated in this division was shared by Garrett Sullivan of Perry Elementary and Liam Mullen of Bristol Consolidated. On tie-breaks, Garret received the trophy. Invited back to play in the March 25 Individuals event were: Andrew Babbitt, Jay Boyce, Margaret Bryan, Jeff Golding (Holbrook), Avery Cole, Ian Pelletier, Nikolai Renedo, Tyler Dama (Stillwater Montessori), Nicholas Beal (Maranatha Homeschool Fellowship), Jaiwei Zou, Deven Haskell, Paul Robinson (Orono), Ari Demoulas, Kurt Eyerer (All-Saints), Zach Maloney (Perry), John Robinson and Henry Chai (Orono). In the JHS Novice section, the top player was Miriam Nielsen from Messalonskee Middle School with a perfect score of 4-0. Warsaw Middle School scored 9.5 points to take top team honors, while Bristol Consolidated scored 8.5 to take the second place team trophy. Top scoring players for Warsaw were Donovan Miller, Nathan Nadeau and Eric Weeman. Top scorers for Bristol Consolidated were Donald Cundy, Steven Severance and Skip Grant. Fourteen teams competed in the High School Championship section. In this section, the format is different, with the five top players from each team meeting in match play. The players face off on Boards one through five. The team winning the match gets a match point. Match points accumulated during the course of the event determines the next match pairings. In round three, Deer-Isle Stonnington and John Bapst fought to a tie with 2.5 match points, while Orono had secured a perfect 3.0 total. In the final round, defending John Bapst squared off against Orono. John Bapst won this match while Deer-Isle Stonington won its match to leave these two tied for the title of State HS Team Champions. While declared co-champions, John Bapst took home the first-place trophy on tie-breaks. Orono, Marshwood and Hampden Academy tied for third with 3 match points each. Members of the HS Championship teams were Kevin Townsend, Ray Solinger, Colin Campbell, Conor Campbell and Jordan Trundy for John Bapst, while Deer-Isle fielded Daniel Robbins, Bryant Ciomei, Shane Eatone, Colin Ciomei, and Jon Eaton. The top girl finisher was Mariah Gleaton of Erskine Academy with a perfect 4-0 score. The top unrated player was Matt Arey of Cheverus, also with a 4-0 score. Invited back to the March 25 Individuals (3-1 score or better on Board 1 and 3.5 or better on other boards) were Kevin Townsend, Jordan Trundy, Colin Campbell, Shane Eaton, Eugene Abramov (Bangor), Cullen Edes (Orono), Matt Arey and Mariah Gleaton. 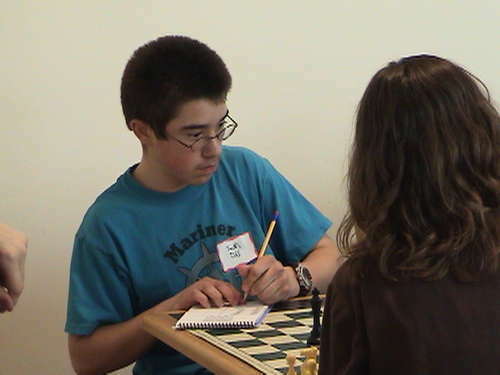 In the High School Reserve section, John Bapst took first place team again, with 11 points out of a possible 12. Top three scorers for the John Bapst team were Joshua Andrews, Zach Lapierre and Murray Bridges. Second place team went to Bucksport with 8 points and top three scoring team members Craig Kneeland, Max Cronin and Lloyd Turk. Invited back to the Individuals were Joshua Andrews, Zach Lapierre, Murray Bridges, Nick Borelli , Frank Kessler, Mathew Versoloff, Fritz Eyerer, Ben Amaral (John Bapst), Lily Briggs (Maranatha Homeschool Fellowship) and Craig Kneeland. 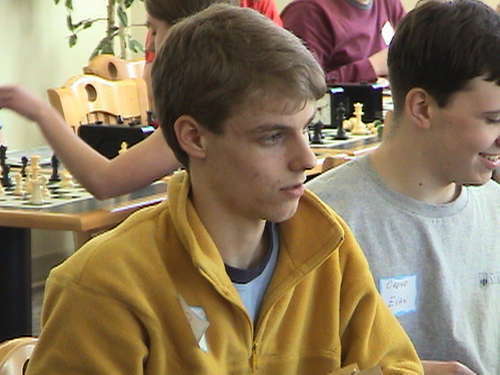 In the HS Novice section, the top player was Zachary Smith (John Bapst) with a perfect 4.0 score. The John Bapst team, with Zachary Smith, Alex Ortiz and Ken Willey as top scorers and 10 team points, took home the first place team trophy. Second place was a tie between Machias and Bucksport with 6.5 point each. On tie-breaks, Machias received the second place team trophy. Machias fielded Jennifer Pelletier, Ryan Beck, Chris Sanborn and Chris Buxton, while the Bucksport team consisted of Chris Holmes, Corey Landeen and Eric Falvey. 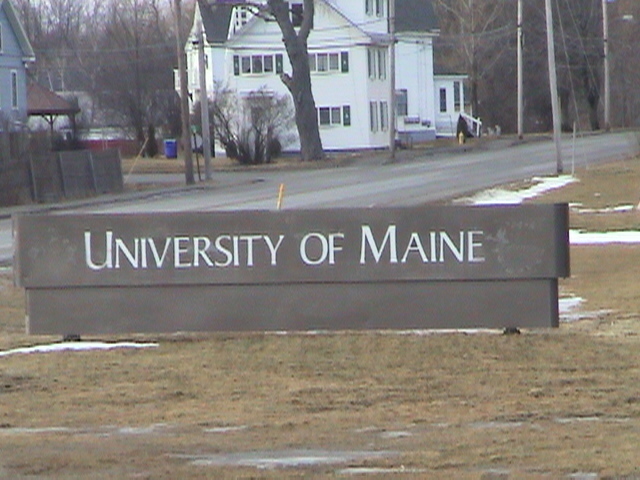 The tournament was hosted by the University of Maine in Orono with sponsorship by the College of Engineering, Provost/Enrollment Management and the University Women’Äôs Studies. Tournament Leaders were Dan DeLuca, Mark Woida, Fred Irons and Ralph Townsend. Tournament Directors were Steve Wong, Phillip Lowell, and Tom Sandford. Tournament trophies were coordinated by Bob Solinger. 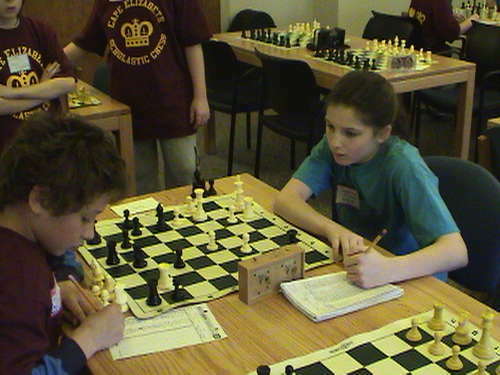 The annual State scholastic tournaments are overseen by the Maine Association of Chess Coaches (MACC), Kathy Richards, treasurer. The organizers extended thanks to the many coaches, parents and volunteers that make this event special year after year. Upcoming are the State Individual Tournaments on March 25 to determine the State Elementary, Junior High and High School Individual Champions. For information and registration forms for this event, contact Ron Lewis (e-mail at raltiger@aol.com). 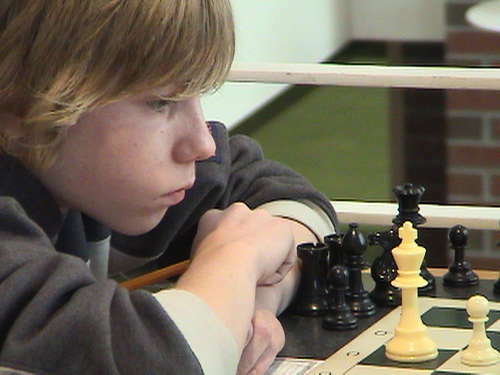 A companion event on this date will be the Second Sidekick Quads, a tournament for adults, the proceeds of which go to further Maine scholastic chess. Contact Ralph Townsend for details and entry (R_Townsend@umit.maine.edu). On April 1, MACC will offer the First Annual All-Girls K-12 Scholastic Tournament. Contact Dan DeLuca for details and entry (dcdeluca@yahoo.com). All these events will take place at the University of Maine Memorial Union in Orono. 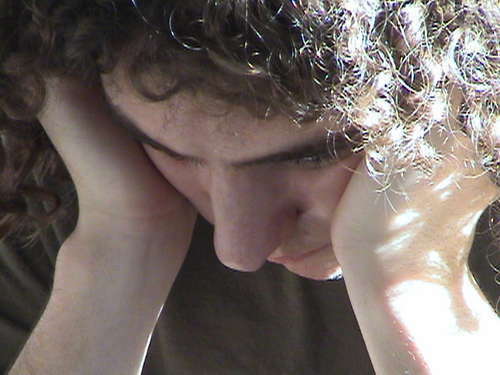 Improve Your Position, Click On ChessMaine.net!